HP Multi Jet Fusion: A revolutionary technology engineered to resolve critical gaps in the combination of speed, quality and cost, and deliver on the potential of 3D printing. "We are on the cusp of a transformative era in computing and printing," said Dion Weisler, executive vice president, Printing & Personal Systems (PPS), HP. "Our ability to deliver Blended Reality technologies will reduce the barriers between the digital and physical worlds, enabling us to express ourselves at the speed of thought -- without filters, without limitations. This ecosystem opens up new market categories that can define the future, empowering people to create, interact and inspire like never before." Leveraging the company's decades of leadership in the print market and advanced materials science, HP Multi Jet Fusion is designed to resolve fundamental limitations in today's 3D print systems while delivering higher productivity and quality at a lower cost (1). "As we examined the existing 3D print market, we saw a great deal of potential but also saw major gaps in the combination of speed, quality and cost," said Stephen Nigro, senior vice president, Inkjet and Graphic Solutions, HP. "HP Multi Jet Fusion is designed to transform manufacturing across industries by delivering on the full potential of 3D printing with better quality, increased productivity, and break-through economics(1)." Multi Jet Fusion is built on HP Thermal Inkjet technology and features a unique synchronous architecture that significantly improves the commercial viability of 3D printing and has the potential to change the way we think about manufacturing. 10-Times Faster: Images entire surface areas versus one point at a time to achieve break-through functional build speeds that are at least 10 times faster than the fastest technology in market today(2). New Levels of Quality, Strength and Durability: Proprietary multi-agent printing process utilizing HP Thermal Inkjet arrays that simultaneously apply multiple liquid agents to produce best-in-class quality that combines greater accuracy, resiliency and uniform part strength in all three axis directions. Accuracy and Detail: Capable of delivering fully functional parts with more accuracy, finer details and smooth surfaces, and able to manipulate part and material properties, including form, texture, friction, strength, elasticity, electrical, thermal properties and more -- beyond other 3D print processes. Achieves Break-through Economics: Unifies and integrates various steps of the 3D print process to reduce running time, cost, energy consumption and waste(3) to significantly improve 3D printing economics (1). Together, these advancements have the potential to revolutionize production and offer small businesses a new way to produce goods and parts for customers. HP is committed to developing a platform that will become an industry standard and remains focused on growing the highest potential commercial markets. While the HP 3D Print technology is available today, HP is working directly with customers under the HP Open Customer Engagement Program. Through this program, HP will continue to extend the capabilities of the HP 3D Print platform throughout development and will provide a certification process for partners to drive materials innovation. 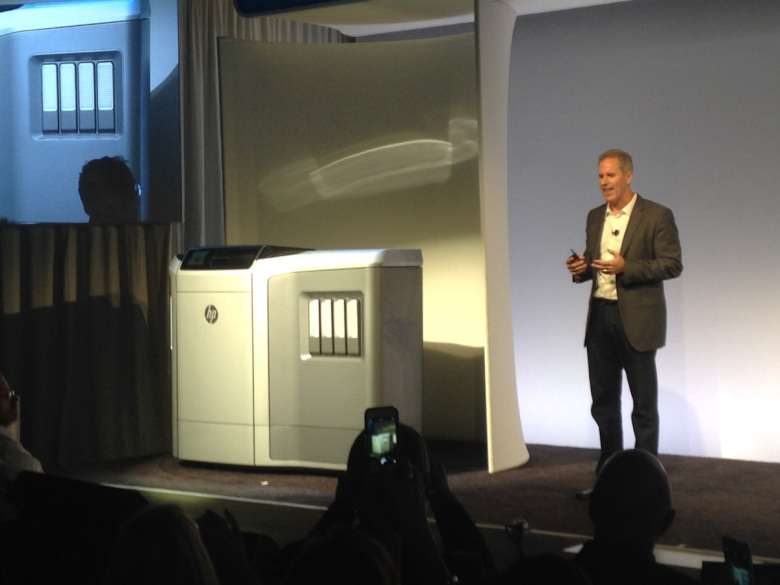 Wider distribution of the HP 3D Print system will begin in 2016(4). By inviting open collaboration, HP and contributors will be able to achieve greater flexibility and versatility in 3D Print materials beyond the current use of thermoplastics, which will enable new solutions in segments such as additive manufacturing and will expand applications for engineering, architecture and consumer goods. HP will also bring its color science expertise and the full-color capabilities of traditional HP printing to 3D world in future-generation 3D Print systems. The first product available in HP's Blended Reality ecosystem, Sprout by HP combines the power of an advanced desktop computer with an immersive, natural user interface to create a new computing experience. "We live in a 3D world, but today we create in a 2D world on existing devices," said Ron Coughlin, senior vice president, Consumer PC & Solutions, HP. "Sprout by HP is a big step forward in reimagining the boundaries of how we create and engage with technology to allow users to move seamlessly from thought to expression." Combining a scanner, depth sensor, hi-resolution camera and projector into a single device, Sprout by HP allows users to take physical items and seamlessly merge them into a digital workspace. The system also delivers an unmatched collaboration platform, allowing users in multiple locations to collaborate on and manipulate a single piece of digital content in real-time. "People have always created with their hands," added Coughlin. "Concurrently, technology has progressed from the first transistors, through calculators to today's most sophisticated computing platforms. Until now, the physical and digital worlds have largely been separated and digital creation has remained in 2D. With Sprout by HP, we introduce the first immersive computing platform, seamlessly merging these two worlds together, enabling people to intuitively bring their creations, work, and projects to life in 3D." Dual-screen Experience: A workspace designed for creative expression and human interaction with an integrated vertical HD touch screen coupled with a 20 point capacitive touch mat. The Sprout Illuminator: A projection system that scans and captures real-world objects in 3D, allowing the user to immediately interact and create. HP Workspace: A software platform built expressly for Sprout to take full advantage of the dual-screen experience to make working and creating seamless, intuitive and engaging. True Remote Collaboration: The way collaboration should be. An interface that advances how users work, collaborate and share, with simultaneous visual and workspace connectivity, allowing concurrent creativity and content manipulation. Advanced Platform: A next-generation computing platform featuring a powerful 4th generation Intel i7 Processor, 1TB of storage in an easy-to-use dual-screen interface, and a Windows 8.1 multi-touch experience. The potential of Sprout by HP's unique configuration is fully realized through the Sprout Marketplace, an application marketplace that contains a growing suite of applications that are optimized to take advantage of Immersive Computing platform to enhance how users work, play and engage with entertainment. The Sprout Marketplace currently contains a suite of Windows-based applications designed uniquely for the dual-screen environment including the Martha Stewart CraftStudio, DreamWorks Animation Story Producer, Crayola's Draw & Sing,GestureWorks Gameplay and first party experiences from HP including Create, Collaborate and Capture, enabling users to easily capture physical objects, manipulate them in a digital environment, and collaborate and share their creations in new ways.